Auto Recycle Bin — Auto cleanup of the recycle bin using selected settings. We use the Recycle Bin often, however, since 1995 this element of the operating system has not changed at all. The schema of usage is as old as the Windows OS itself — the Recycle Bin collects items until you empty it or until it takes up too much disk space. ﻿We use the Recycle Bin often, however, since 1995 this element of the operating system has not changed at all. The schema of usage is as old as the Windows OS itself — the Recycle Bin collects items until you empty it or until it takes up too much disk space. However, in practice we use it in another way, and the schema becomes inconvenient or even annoying. 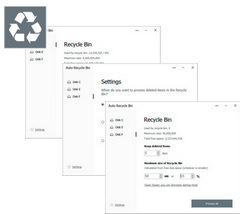 Today, we are introducing improvements for your Recycle Bin, which will make it much more useful. Items will be kept in it for a longer period of time, they will take less size from your disk space, and, most importantly, cleaning will be fully automatic depending on your rules. Regular users always worry about the Recycle Bin, thinking on background of cause. Users forget to empty it and many useless files are kept for no reason. Also, if users delete a large file, or unneeded file, it’s better not to place it in the Recycle Bin and waste disk space, they should empty it as soon as possible. Private files also should not be kept there, they should be deleted immediately. Sometimes users only want to delete a few files, and they don’t need to empty the entire Recycle Bin. The old schema requires user attention all of the time. Our program provides a solution for all of these problems. By using our program, all items in your Recycle Bin will be monitored and deleted depending on your rules. You can set the Recycle Bin to empty when shutting down the Windows OS, or set it to delete large files after only a few hours. 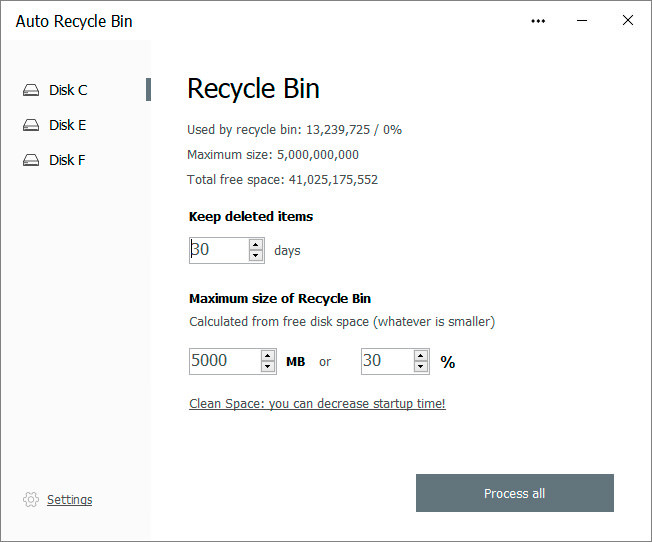 If items don’t take up much disk space, you can set the Recycle Bin to keep them for a month or other longer time frames. You can even set rules depending on the deletion date, extension of the file or its size. In other words — rules will provide automatic cleaning, so you will never need to worry about the Recycle Bin again. Our program has many features related to maintaining your Recycle Bin and your access to deleted items will be even more convenient. We will provide you with a set of pre-defined standard rules, you can improve them to meet your needs. On top of all these benefits, the program is also completely free. We're constantly supporting this program, moving ahead with the world's progress, every one or two month we release new version. We do fix bugs and add new features. Our program has received multiple awards from notable rating agencies and bloggers. This is trust and reliability. We have been in business since 2002, that's why we have not just knowledge, but also a lot of experience. Sometimes problem happens. 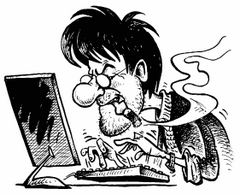 However, according our statistics, our support team responds to 90% of requests within one hour! Other 10% get response within six to twelve hours. Security and privacy is our main goal. We use only newest and industry leading standards and protocols to process user's data. With us you're in safe. Size: 1,58 / 1,60 MB.